Opening to the public in May 2012, Tokyo Skytree is the world’s tallest tower and second tallest building. 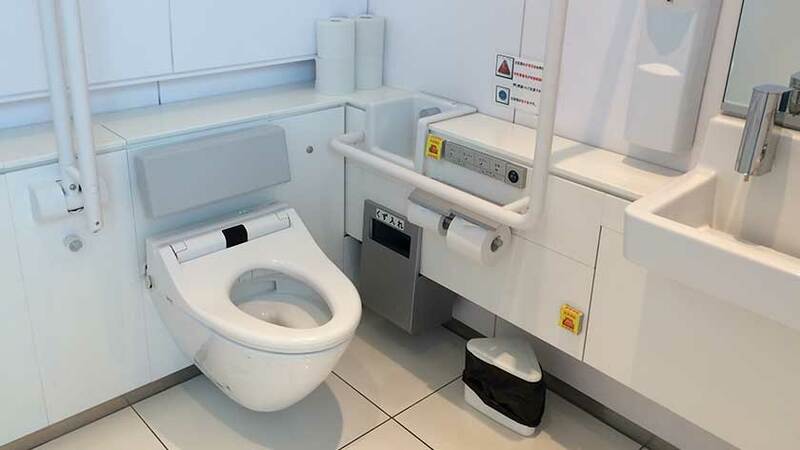 With its excellent accessibility features for disabled guests, it is also home to the world’s highest accessible toilets! 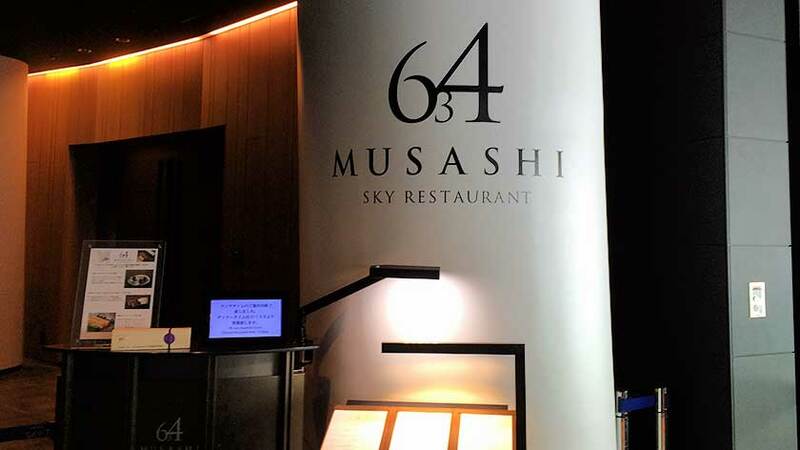 Tokyo Skytree is a broadcasting, restaurant, and observation tower in Sumida, Tokyo, and reaches a height of 634m (a play on words as 6-3-4 can be read as mu-sa-shi, the old name of the land where the tower is located). 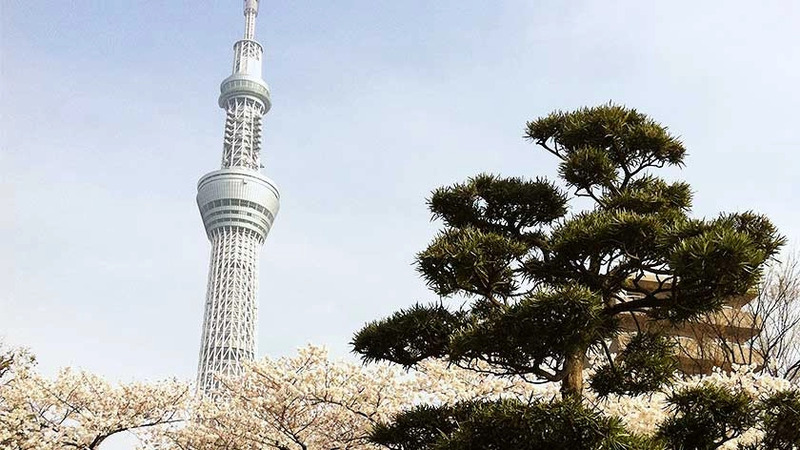 The original broadcast tower for the Tokyo area – Tokyo Tower – was no longer able to provide digital television broadcasting to the entire area due to high-rise buildings built in the surrounding area, therefore requiring a new tower to be built. 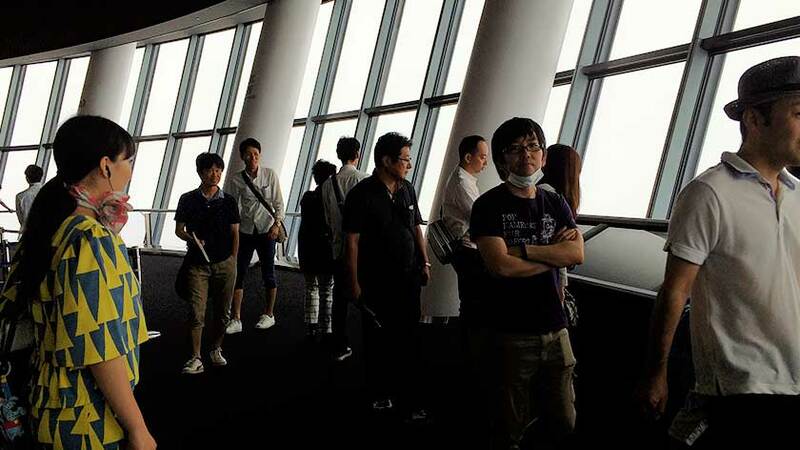 Created with a fusion of neo-futuristic design and traditional Japanese esthetics, Tokyo Skytree features observatories at 350m, with a capacity of up to 2000 people, and 450m, with a capacity of 900 people. The upper observatory features a spiral, glass-covered skywalk in which visitors ascend the last 5 meters to the highest point at the upper platform. The tower is “Skytree white” and is illuminated either sky blue or purple, alternating daily. At the base of the tower there is a large shopping mall called Sola Machi and two train stations. Built in 2012, Tokyo Skytree and the accompanying Sola Machi shopping mall have excellent accessibility. 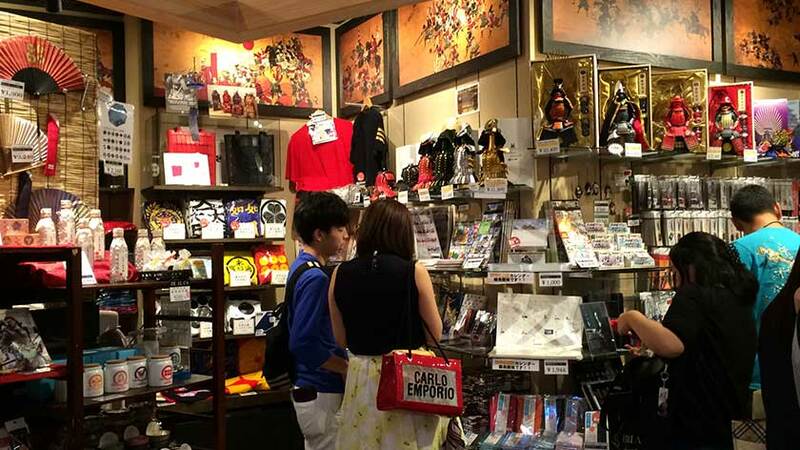 Sola Machi is a large shopping mall that offers an incredible selection and is very much focused on items foreign visitors may want to buy – do your souvenir shopping here! 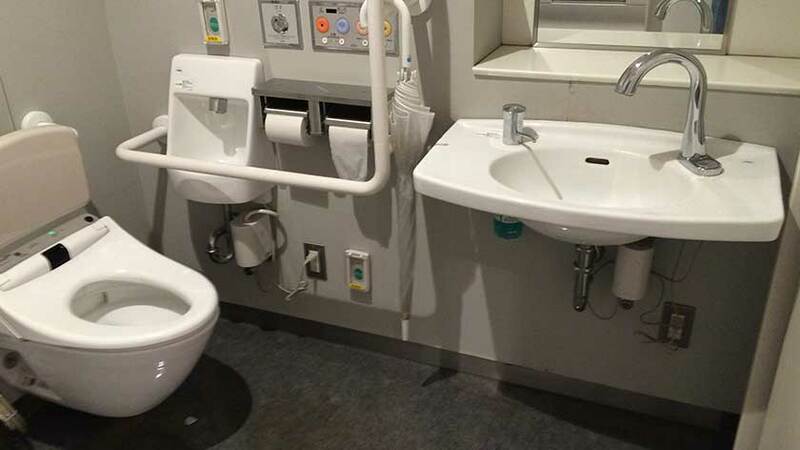 Wheelchair rentals and currency exchange are available and there are multipurpose toilets on every floor (though, they tend to be busy, so you may need to wait). The entrance to Tokyo Skytree is accessible from the 4th floor of Sola Machi. While there is generally a long line to buy tickets, contacting a staff member will get disabled guests to the front of the line. 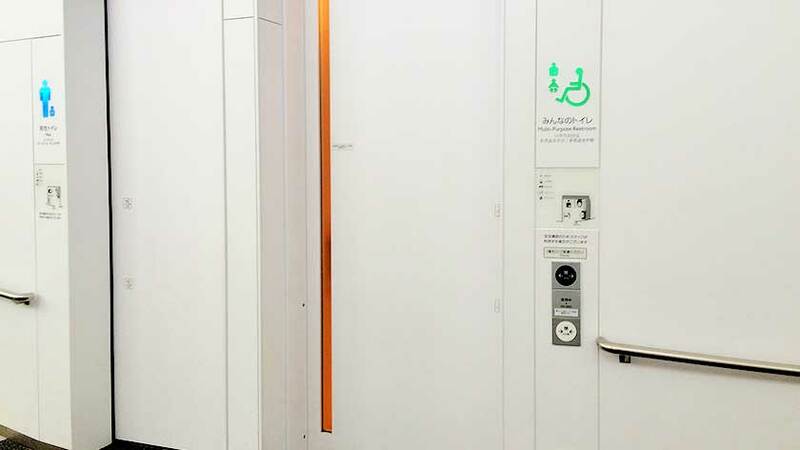 As with many tourist locations in Japan, there is a discount available to disabled guests and foreign disability ID cards are accepted as proof of disability. After purchasing your tickets, you are again taken to the front of the line to take the elevator to the first observation deck – the Tembo Deck. The Tembo deck is made up of three floors altogether and a dedicated elevator connects all three. There are wheelchair accessible toilets on each of the three floors. They are great, but the backrest is a bit short and may not give adequate support. 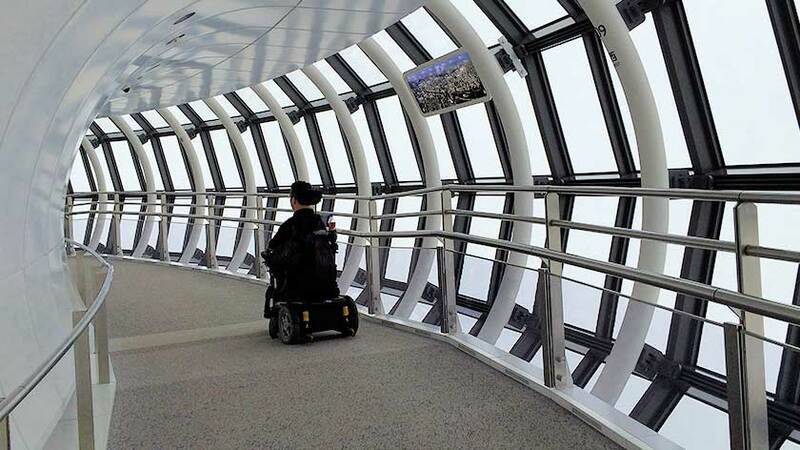 There are two cafes, a shop, and a restaurant available as well as a glass floor – wheelchair tested and approved of course (^_^). Click here for the floor guide: Tembo Deck Floor Guide. The only accessibility challenge is crowding – on a busy day, there could be up to 2000 other people. For those interested in going higher, the Tembo Galleria is 100m higher but costs an additional fee. If you received a discount for your first tickets, showing them at the ticket counter will get you a discount on the Tembo Galleria tickets as well. Due to this extra cost, few people go and there is less crowding. However, the floor spirals upward and is carpeted, making it a bit difficult in a manual wheelchair. 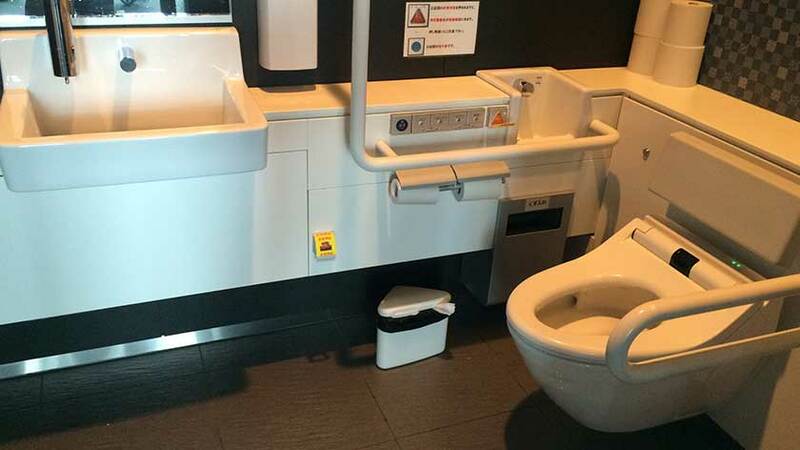 A wheelchair accessible toilet is available. Click here for the floor guide: Tembo Galleria Floor Guide. When returning to the ground floor, once again those with disabilities are allowed to skip the line and take the first available elevator. Tokyo Skytree is one of the most popular travel destinations in Tokyo and can give great views of Mount Fuji during the day and romantic city lights and night. 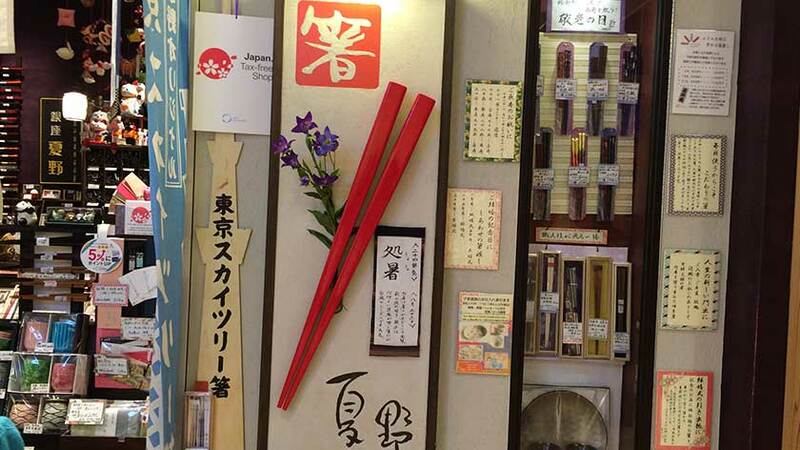 The Sola Machi shopping mall is a great place to buy souvenirs that are distinctly Japanese, but not tacky. Aside from the crowds, the accessibility features are incredible. It is only one stop from Asakusa – making it a great way to see both ancient and modern Japan within a matter of minutes.